Dr Katherine Dunn, now a Research Associate in the Intelligent Systems Group in the Department of Electronics at York, presents her findings in a paper published in Nature. It describes how Dr Dunn's experiments at Oxford demonstrated that DNA strands could not only self-assemble, but, in doing so, they follow distinct and identifiable pathways. DNA origami is a technique for using DNA to build inanimate physical structures at the nanoscale. By exploiting DNA's remarkable properties, scientists can synthesize a wide range of self-assembling nanostructures. A typical DNA origami shape often folds primarily as desired, but sometimes misfolded structures can occur. To gain a more detailed understanding of the assembly process, Dr Dunn studied a model system consisting of a structure capable of folding into many different configurations. She used specialised image processing to look at the range of possible shapes, and established that there are preferred folding pathways for these structures and that assembly is not random. She found evidence for co-operation between DNA strands and showed that they can influence each other during assembly. Her data also proved that minor modifications to the components could be used to significantly alter how the nanostructure forms. This discovery means that scientists will have the ability to exert more control over DNA self-assembly and, as a result, may radically improve the overall success of the process. 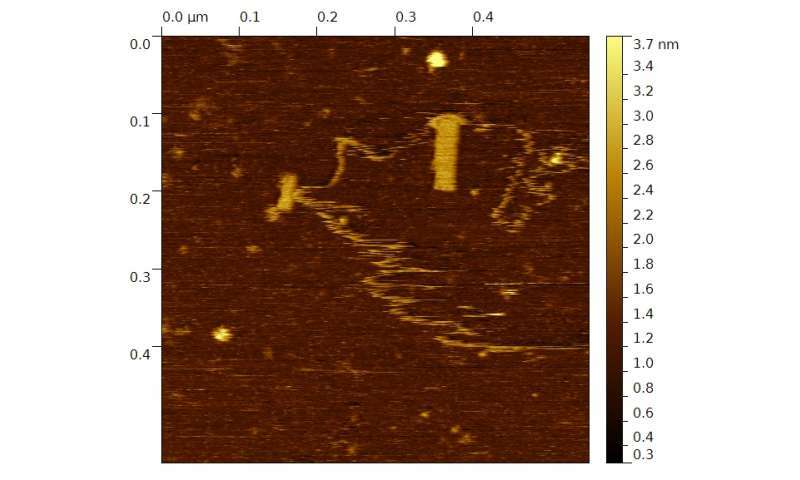 Dr Dunn said: "My work at Oxford shed light on the self-assembly of DNA origami, and understanding this process is a significant breakthrough because it could enable the development of more sophisticated DNA nanostructures for specific purposes." Potential applications of DNA origami structures and devices include targeted drug delivery, molecular computing and the construction of nanoscale chemical assembly lines. Now, as a member of Professor Andy Tyrrell's team at York, Dr Dunn investigates how the characteristics of DNA machines change when they are immobilized on a surface. She is working towards their integration with conventional electronics and their potential use as components of bio-inspired computing systems. Dr Dunn says: "York is an inspiring place to live and work, and the research we're doing in the Department of Electronics is very exciting, with the potential for high-impact discoveries in the future."